Toyota City, Japan, May 12, 2017 - (JCN Newswire) - The TOYOTA GAZOO Racing World Rally Team heads to Rally de Portugal (May 18-21) with hopes of accelerating the development of the Yaris WRC in its debut FIA World Rally Championship season. 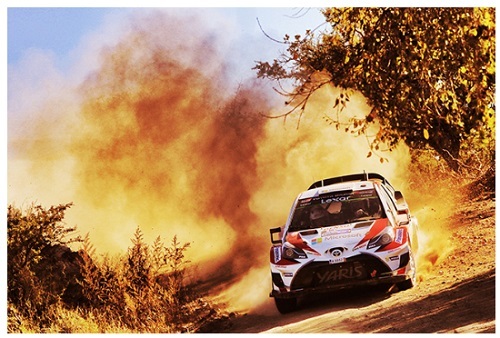 Thanks to some challenging and technical stages, Portugal will as usual be an extremely tough rally, but the Toyota squad will use it to learn more about what is needed to compete at the top and improve the Yaris WRC further, as has been the case on every event up to now. For the first time, a third car will be entered for testing purposes with Esapekka Lappi behind the wheel, joining Jari-Matti Latvala and Juho Hanninen in action on the gravel event, which serves as round six of the 2017 season. Latvala, who continues to hold second in the drivers' standings, was the winner in Portugal in 2015. Hanninen has not competed on the event since the year before, 2014, but back then it was based in the south of Portugal: so the northern stages are all new to him. Lappi will be embarking on his first event at the top level of the WRC, but Portugal was the scene of his first win in the WRC2 category in 2013, before going onto claim the WRC2 title last year. "We had a few new things to test for Portugal, with the suspension as well as some other components, but the weather was really bad so it's hard to know how realistic our results were. Portugal is a tough event with some very technical stages but this is what makes it a classic event too. Although there are still a lot of unknowns--especially with the conditions--we hope to make another step forwards on gravel, improving the car step by step as we have been doing all year. For this we will be helped by our third test car in Portugal with Esapekka and Janne, which will definitely bring us some extra information." "What I learned in Argentina is that the first day is very important; you really want to try and be in the top five so that you can have a good road position for the following day. So that will be my objective in Portugal, and if the weather is bad on the first day, my position of second on the road could actually help me--as the road conditions behind might deteriorate. Before the rally, we tested a few things, trying out some dampers and also experimenting with the ride height, so that we can perform to the maximum of our potential in rough conditions as well." "I tested when the weather was still OK: it was quite warm, and we were able to try a few new things with suspension and differentials. Although I've done Rally Portugal before, this is actually my first time on the stages in the north. I like these stages, but from what I can see there could be a lot of road cleaning, so hopefully my road position might help me. Portugal is a bit like Argentina, only not as rough, so I think we can use many of the lessons that we learned there to make more progress. The second run through the stages might be a bit tricky, so we will need to be careful." "I've been able to test before the rally in Portugal, which has given me a good taste of some future development directions, but these may not be the conditions we experience when it comes to the actual competition. It's obviously very exciting for me to be starting my first rally in the Yaris WRC: the opportunity I've been waiting for all of my life. But this is team effort, and my role is to collect as much data as possible for the team to develop the car further. The most important thing is to finish: never easy on such a challenging event like Portugal. For my own experience too, I need to make sure that I do all the stages, so we're going to take a very calm and focussed approach to the rally."